We need to give it our support in order to expose Trump's drug price hypocrisy and show that progressives have real solutions to the problems America faces. Resist Trump's Big Pharma scam. 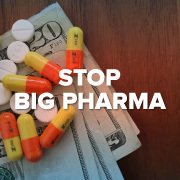 Tell Congress to let Medicare negotiate drug prices. Signed and noted. Thank you, Dogan. "92% We've reached 69,690 of our goal of 75,000."